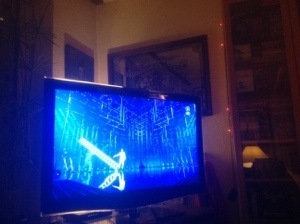 Tonight’s the Eurovision Song Contest, and during the voting they’re singing Ode to Joy and climbing ladders. As one does. I don’t care how camp this thing is, I watch it every year, mock it on twitter and laugh at the voting from the countries that couldn’t get their entry into the Finals. If you have no idea what this is, I’m not sure you want to research it. My parents were visiting me one year during the weekend when the Grand Prix was on. They watched it with me and were completely baffled by the whole ordeal. This year? I suppose the bearded lady from Austria. Or the Polish maidens churning butter & washing clothes. Yes, that was a thing. It’s a bit like an annual World Cup for the Homosexualists. Was that an insensitive comment? I can live with that. It’s a bit like an annual World Cup for Camp People. CTFY. You don’t have to be any particular sexuality to be camp, so the above is a lot less insulting to homosexual people. Don’t think I was being insulting, but to each his own.